Sources of CPU benchmarks, used for estimating performance on similar workloads, have been available throughout the course of CPU development. For example, the Standard Performance Evaluation Corporation has compiled a large set of applications benchmarks, running on a variety of CPUs, across a multitude of systems. There are certainly benchmarks for GPUs, but only during the past year has an organized set of deep learning benchmarks been published. Called DeepMarks, these deep learning benchmarks are available to all developers who want to get a sense of how their application might perform across various deep learning frameworks. The benchmarking scripts used for the DeepMarks study are published at GitHub. The original DeepMarks study was run on a Titan X GPU (Maxwell microarchitecture), having 12GB of onboard video memory. Here we will examine the performance of several deep learning frameworks on a variety of Tesla GPUs, including the Tesla P100 16GB PCIe, Tesla K80, and Tesla M40 12GB GPUs. The deep learning frameworks covered in this benchmark study are TensorFlow, Caffe, Torch, and Theano. All deep learning benchmarks were single-GPU runs. The benchmarking scripts used in this study are the same as those found at DeepMarks. DeepMarks runs a series of benchmarking scripts which report the time required for a framework to process one forward propagation step, plus one backpropagation step. The sum of both comprises one training iteration. The times reported are the times required for one training iteration per batch, in milliseconds. To start, we ran CPU-only trainings of each neural network. We then ran the same trainings on each type of GPU. The plot below depicts the ranges of speedup that were obtained via GPU acceleration. Figure 1. GPU speedup ranges over CPU-only trainings – geometrically averaged across all four framework types and all four neural network types. If we expand the plot and show the speedups for the different types of neural networks, we see that some types of networks undergo a larger speedup than others. Figure 2. 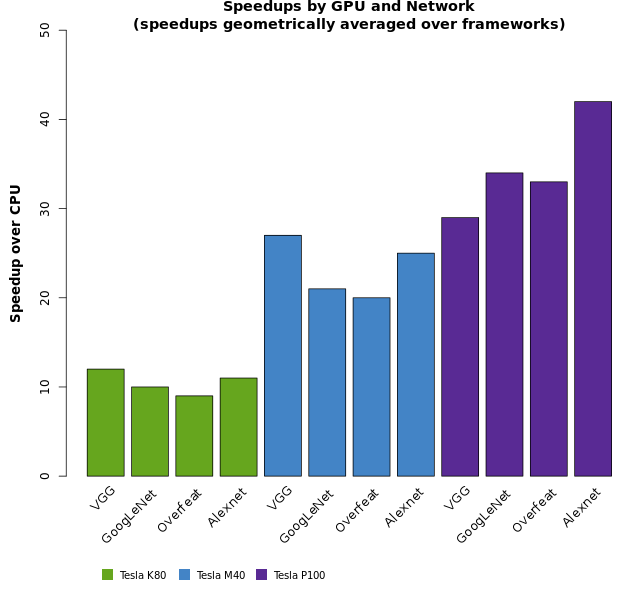 GPU speedups over CPU-only trainings – geometrically averaged across all four deep learning frameworks. The speedup ranges from Figure 1 are uncollapsed into values for each neural network architecture. If we take a step back and look at the ranges of speedups the GPUs provide, there is a fairly wide range of speedup. The plot below shows the full range of speedups measured (without geometrically averaging across the various deep learning frameworks). Note that the ranges are widened and become overlapped. Figure 3. Speedup factor ranges without geometric averaging across frameworks. Range is taken across set of runtimes for all framework/network pairs. We believe the ranges resulting from geometric averaging across frameworks (as shown in Figure 1) results in narrower distributions and appears to be a more accurate quality measure than is shown in Figure 3. However, it is instructive to expand the plot from Figure 3 to show each deep learning framework. Those ranges, as shown below, demonstrate that your neural network training time will strongly depend upon which deep learning framework you select. Figure 4. GPU speedups over CPU-only trainings – showing the range of speedups when training four neural network types. The speedup ranges from Figure 3 are uncollapsed into values for each deep learning framework. As shown in all four plots above, the Tesla P100 PCIe GPU provides the fastest speedups for neural network training. With that in mind, the plot below shows the raw training times for each type of neural network on each of the four deep learning frameworks. Figure 5. Training iteration times (in milliseconds) for each deep learning framework and neural network architecture (as measured on the Tesla P100 16GB PCIe GPU). We provide more discussion below. For reference, we have listed the measurements from each set of tests. Table 1: Benchmarks were run on a single Tesla P100 16GB PCIe GPU. Times reported are in msec per batch. The batch size for all training iterations measured for runtime in this study is 128, except for VGG net, which uses a batch size of 64. Table 2: Benchmarks were run on a single Tesla K80 GPU chip. Times reported are in msec per batch. Table 3: Benchmarks were run on a single Tesla M40 GPU. Times reported are in msec per batch. Table 4: Benchmarks were run on dual Xeon E5-2690v4 processors in a system with 256GB RAM. Times reported are in msec per batch. When geometric averaging is applied across framework runtimes, a range of speedup values is derived for each GPU, as shown in Figure 1. CPU times are also averaged geometrically across framework type. These results indicate that the greatest speedups are realized with the Tesla P100, with the Tesla M40 ranking second, and the Tesla K80 yielding the lowest speedup factors. Figure 2 shows the range of speedup values by network architecture, uncollapsed from the ranges shown in Figure 1. The speedup ranges for runtimes not geometrically averaged across frameworks are shown in Figure 3. 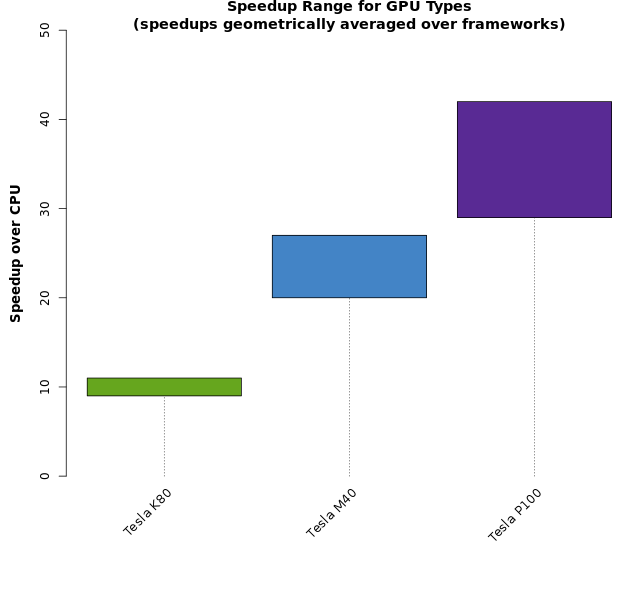 Here the set of all runtimes corresponding to each framework/network pair is considered when determining the range of speedups for each GPU type. Figure 4 shows the speedup ranges by framework, uncollapsed from the ranges shown in figure 3. The degree of overlap in Figure 3 suggests that geometric averaging across framework type yields a better measure of GPU performance, with more narrow and distinct ranges resulting for each GPU type, as shown in Figure 1. The greatest speedups were observed when comparing Caffe forward+backpropagation runtime to CPU runtime, when solving the GoogLeNet network model. Caffe generally showed speedups larger than any other framework for this comparison, ranging from 35x to ~70x (see Figure 4 and Table 1). Despite the higher speedups, Caffe does not turn out to be the best performing framework on these benchmarks (see Figure 5). When comparing runtimes on the Tesla P100, Torch performs best and has the shortest runtimes (see Figure 5). Note that although the VGG net tends to be the slowest of all, it does train faster then GooLeNet when run on the Torch framework (see Figure 5). 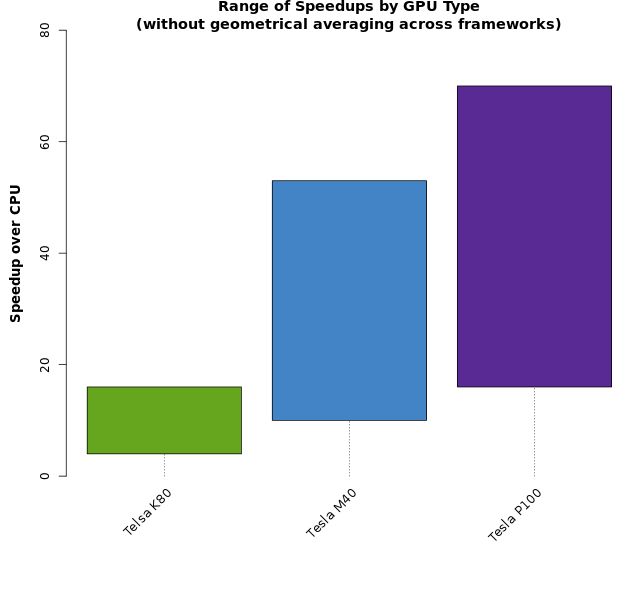 The data show that Theano and TensorFlow display similar speedups on GPUs (see Figure 4). Despite the fact that Theano sometimes has larger speedups than Torch, Torch and TensorFlow outperform Theano. While Torch and TensorFlow yield similar performance, Torch performs slightly better with most network / GPU combinations. However, TensorFlow outperforms Torch in most cases for CPU-only training (see Table 4). Theano is outperformed by all other frameworks, across all benchmark measurements and devices (see Tables 1 – 4). 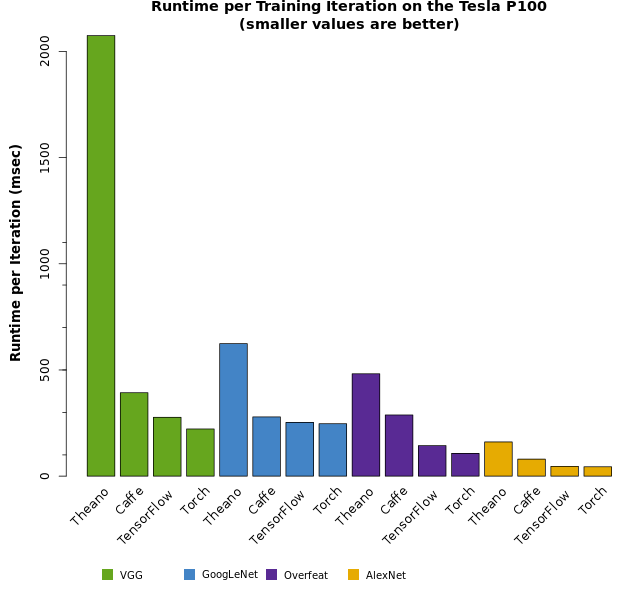 Figure 5 shows the large runtimes for Theano compared to other frameworks run on the Tesla P100. It should be noted that since VGG net was run with a batch size of only 64, compared to 128 with all other network architectures, the runtimes can sometimes be faster with VGG net, than with GoogLeNet. See, for example, the runtimes for Torch, on GoogLeNet, compared to VGG net, across all GPU devices (Tables 1 – 3). 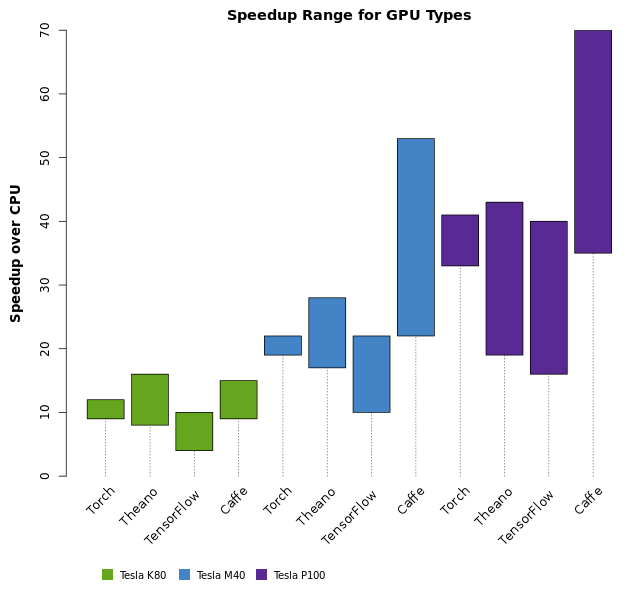 The single-GPU benchmark results show that speedups over CPU increase from Tesla K80, to Tesla M40, and finally to Tesla P100, which yields the greatest speedups (Table 5, Figure 1) and fastest runtimes (Table 6). Table 6: Absolute best runtimes (msec / batch) across all frameworks for VGG net (ver. a). The Torch framework provides the best VGG runtimes, across all GPU types. The results show that of the tested GPUs, Tesla P100 16GB PCIe yields the absolute best runtime, and also offers the best speedup over CPU-only runs. Regardless of which deep learning framework you prefer, these GPUs offer valuable performance boosts. Microway’s GPU Test Drive compute nodes were used in this study. Each is configured with 256GB of system memory and dual 14-core Intel Xeon E5-2690v4 processors (with a base frequency of 2.6GHz and a Turbo Boost frequency of 3.5GHz). Identical benchmark workloads were run on the Tesla P100 16GB PCIe, Tesla K80, and Tesla M40 GPUs. The batch size is 128 for all runtimes reported, except for VGG net (which uses a batch size of 64). All deep learning frameworks were linked to the NVIDIA cuDNN library (v5.1), instead of their own native deep network libraries. This is because linking to cuDNN yields better performance than using the native library of each framework. The data demonstrate that Tesla M40 outperforms Tesla K80. When geometrically averaging runtimes across frameworks, the speedup of the Tesla K80 ranges from 9x to 11x, while for the Tesla M40, speedups range from 20x to 27x. The same relationship exists when comparing ranges without geometric averaging. This result is expected, considering that the Tesla K80 card consists of two separate GK210 GPU chips (connected by a PCIe switch on the GPU card). Since the benchmarks here were run on single GPU chips, the benchmarks reflect only half the throughput possible on a Tesla K80 GPU. If running a perfectly parallel job, or two separate jobs, the Tesla K80 should be expected to approach the throughput of a Tesla M40. Singularity is a new type of container designed specifically for HPC environments. Singularity enables the user to define an environment within the container, which might include customized deep learning frameworks, NVIDIA device drivers, and the CUDA 8.0 toolkit. The user can copy and transport this container as a single file, bringing their customized environment to a different machine where the host OS and base hardware may be completely different. The container will process the workflow within it to execute in the host’s OS environment, just as it does in its internal container environment. The workflow is pre-defined inside of the container, including and necessary library files, packages, configuration files, environment variables, and so on. In order to facilitate benchmarking of four different deep learning frameworks, Singularity containers were created separately for Caffe, TensorFlow, Theano, and Torch. Given its simplicity and powerful capabilities, you should expect to hear more about Singularity soon. Sermanet, Pierre, et al. “Overfeat: Integrated recognition, localization and detection using convolutional networks.” arXiv preprint arXiv:1312.6229 (2013). Szegedy, Christian, et al. “Going deeper with convolutions.” Proceedings of the IEEE Conference on Computer Vision and Pattern Recognition. 2015. Simonyan, Karen, and Andrew Zisserman. “Very deep convolutional networks for large-scale image recognition.” arXiv preprint arXiv:1409.1556 (2014). This entry was posted in Benchmarking, Hardware and tagged deep learning, gpu, K80, M40, P100. Bookmark the permalink. Can you elaborate on which CPU was used for the comparison? How many cores were present in the CPU? We used the E5-2690v4, in a dual socket configuration. Each E5-2690v4 has fourteen Xeon cores.